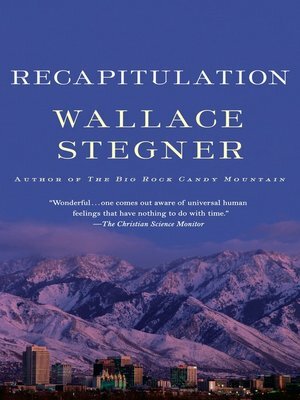 In Recapitulation, by National Book Award and Pulitzer Prize winner Wallace Stegner, the protagonist of his classic novel Big Rock Candy Mountain returns reluctantly to the Salt Lake City of his birth for the funeral an aunt, who is his last link to his family's history, and his own. Now in his sixties,, even after a successful diplomatic career and other achievements that he knows derived from his early life in this place, Bruce Mason cannot help but reflect on the childhood misery caused by those same events. Intimate, reflective, even meditative, Recapitulation gives us what we are seldom offered, a chance to reconnect with a beloved character, to see who he became, and the opportunity to understand his earlier incarnation through his own eyes.